Many trades of NFL draft pick will likely have little impact on a franchise's future. But what about those that do pay off in the biggest way? We break down every team's best swap. There were 41 trades made in the past year involving 2017 NFL draft picks. However, as is the case with any draft trade, it's never immediately apparent how each trade will pay off. Could an organization trading down reap the rewards of value in getting a couple extra selections? Or might the team trading up have played their cards just right to snag a prospect in the slot ahead of where he was going? History tells us that most of those deals will not amount to much (or, in some cases, will turn out to be horrible mistakes). A handful will hit, though, to the point that we’ll be discussing their impact for seasons to come. With that in mind, let’s take a look back and pick out each team’s absolute best move. To keep this discussion relevant, we restricted the trades to drafts from the last 10 years (2007–16), excluding this year's—like discussed above, it's tough to determine the success of the trade without any games or stats to back it up. NFC teams are up first, followed by the AFC teams. Touched on this trade earlier, but the Cowboys’ move up three spots for Bryant came after a Jay Cutler-for-Kyle Orton swap at No. 11 set up a) a 49ers trade up for Anthony Davis, b) an Eagles trade up for Brandon Graham, c) a Broncos trade up for Demaryius Thomas and d) the Cowboys trade up for Bryant. Wild. The Patriots bounced from No. 22 to No. 24 to No. 27 and wound up with S Devin McCourty. The Cowboys landed Bryant, who should climb into the franchise’s all-time top five for yards receiving sometime during the 2017 season. Thirty-one picks after securing Bryant, the Cowboys traded up for LB Sean Lee (picks No. 59 and No. 125 to Philadelphia for No. 55). Another move still paying dividends came in 2013: The Cowboys traded down from No. 8 to acquire No. 31 and No. 74, then used those picks on C Travis Frederick and WR Terrance Williams, respectively. Do other GMs even bother calling the Giants’ Jerry Reese with trade pitches anymore? Reese has been the Giants’ general manager since 2007 and has never swung a deal in Round 1. He also has not traded down since manning his post, an incredible streak—all things considered. There have been a handful of pick-for-player swaps: P Brad Wing in 2016 (No. 229 to Pittsburgh), LB Jon Beason in 2014 (No. 225 to Carolina), LB Keith Rivers in 2012 (No. 167 to Cincinnati). Nothing too significant. Perhaps the success of his Collins acquisition will encourage Reese to get busy again in the future. For the price of a fourth- and seventh-rounder, Reese jumped seven spots to the top of Round 2. Collins was a Pro Bowler and first-team All-Pro in 2016, just his second NFL season. If you’re keeping score at home, that’s a swap of first-rounders plus a fourth- and sixth-round selection for Cox, who now is the centerpiece of Philadelphia’s defense and has notched two straight Pro Bowl nods. The Eagles were very active during the early rounds of that ’12 draft, also sending Kevin Kolb to Arizona for CB Dominique Rodgers-Cromartie and pick No. 51; and acquiring LB DeMeco Ryans from Houston as part of a trade involving three draft slots. This trade occurred during the summer of 2011, a little more than a year after Washington brought in McNabb, sending second- and fourth-round picks to Philadelphia. Painted in that light, unloading the veteran QB a year later for a sixth-rounder doesn’t exactly shine. But McNabb played all of six games as a Viking before his career ended, and Washington drafted Morris—he rushed for 1,613 yards and 13 TDs as a rookie, and for 4,700-plus yards during his four-year Redskins stint. Much of Washington’s recent draft history is checkered by the king’s ransom paid for Robert Griffin III in 2012. The Redskins, however, have had a little success trading down: In 2011, for example, they handed pick No. 10 (Blaine Gabbert) to Jacksonville for Nos. 16 and 49, eventually flipping those spots into OLB Ryan Kerrigan, DT Stephen Paea, RB Roy Helu and WR Aldrick Robinson. Three drafts later, they selected OLB Trent Murphy (No. 47) and OL Spencer Long (No. 78) after trading out of pick No. 33. The Bears’ two strongest draft-trade moves of the past decade both involve wide receivers and both occurred in 2012. A month or so before the draft, the Bears sent a pair of third-rounders to the Dolphins for Marshall. His stay in Chicago had a few bumps, but he also averaged 109 receptions and 1,401 yards over the first two of his three Windy City seasons. He had help in the offense from fellow WR Alshon Jeffery, whom the Bears traded up to take in Round 2 of the ’12 draft (picks No. 50 and No. 150 to the Rams for No. 50). Marshall and Jeffery’s QB during their stretch together was Jay Cutler, brought over in the aforementioned Cutler-Orton trade. Chicago took Cutler and pick 140 of the 2009 draft (WR Johnny Knox) and shipped Orton, picks No. 18 and No. 84, and a ’10 first to the Broncos. Worth it? Depends on how one feels about Cutler’s tenure. Avril made his way to Detroit just in time for the Lions’ 0–16 season, so ... congratulations? That infamy aside, Avril was a standout on a defense that later also featured Ndamukong Suh. In his five seasons with the Lions, Avril recorded 39.5 sacks (and recovered five fumbles), including 11.0 in 2011—a performance that led Detroit to place the franchise tag on him for 2012. The Lions more than got their money’s worth on the pair of fourth-round picks they shipped to Dallas. The Lions and Cowboys pulled off more of a headline-grabbing deal the next year, Detroit sending WR Roy Williams and pick No. 210 to Big D in exchange for pick Nos. 20, 82 and 192. If only the Lions had done better with those draft choices (TE Brandon Pettigrew, WR Derrick Williams, RB Aaron Brown). They actually received more mileage out of another ’09 draft trade: pick No. 65 for Nos. 76, 115 and 228; Detroit turned pick No. 76 into LB DeAndre Levy. The Patriots traded down twice during the ’09 draft’s first round: from 23 to 26—so Baltimore could select OT Michael Oher—and the 26-to-41 swap shown here. The Packers already had used their own Round 1 pick (No. 9 overall) on DT B.J. Raji, so they had to fork over a decent amount to add Matthews, too. Even so, a second- and two third-round picks look like nothing now. Matthews has six Pro Bowl berths and 72.5 career sacks to his credit in Green Bay. Raji (unofficially) retired from football last year, after a lengthy up-and-down run in Green Bay. A defender the Packers acquired the following draft, S Morgan Burnett, still patrols Lambeau Field alongside Matthews. The Pack traded picks No. 86 and No. 122 in the 2010 draft to take Burnett at No. 71. They’re joined by WR Jordy Nelson, a 2008 draft acquistion—the Packers took him at 36, after trading down from No. 30. No disrespect to Sullivan, who started 93 games for the Vikings from 2009–14, but Allen is the headline act in this deal (...at least from Minnesota’s end—the Chiefs used that No. 73 pick on RB Jamaal Charles). Kansas City traded away Allen off an All-Pro 2011 season in which he led the league with 15.5 sacks. He just kept right on harassing opposing QBs as a Viking, notching a whopping 85.5 sacks over the next six seasons, highlighted by a 22.0-sack showing in 2011. Allen, who retired following the 2015 season, could be headed to the Hall of Fame down the road. It’s far too early to place Minnesota S Harrison Smith in that category, but let’s put a pin in this 2012 deal: Picks 35 and 98 to Baltimore for pick 29, where the Vikings nabbed Smith. The now 28-year-old defender has developed into one of the game’s top safeties. This was a huge gamble by the Falcons, as they essentially wagered two drafts on Jones becoming a superstar. Luckily for the team, he did. While the Browns spun their extra picks into the likes of Brandon Weeden, Greg Little and Phil Taylor, the Falcons built their offense around Matt Ryan, Tony Gonzalez and Jones. Two seasons ago, Jones led the NFL with a staggering 136 receptions for 1,871 yards. With even average 2017 and ’18 seasons, he could surpass 10,000 career yards receiving ... and he’s still only 28 years old. Speaking of Gonzalez, though, a tip of the cap to Atlanta for bringing him in. In April 2009 the Falcons traded their ’10 second-rounder to the Chiefs for the near-certain future Hall of Famer. He wasn’t as productive in Atlanta as he was in Kansas City (in part because Jones started hogging touches), but Gonzalez still racked up 409 catches, 35 touchdowns and four Pro Bowl bids during his five Falcons seasons. This is the second appearance of the 2012 draft’s 73rd pick on our list—after Carolina traded it to Chicago, the Bears used it to acquire Brandon Marshall from Miami. The Dolphins then dealt the pick again, to the Chargers, who used it on DB Brandon Taylor. Olsen’s relocation occurred in the summer of 2011, long before Chicago and Miami got to work. Rather than sign Olsen to a contract extension, the Bears opted to trade him away. In their defense, though, it wasn’t until Olsen paired with Cam Newton that he became the ultra-productive tight end he is today. He’s topped 1,000 yards receiving each of the past three years. A Panthers draft trade of note, in which they actually selected players: 2009, pick No. 202 to Oakland for No. 216 and a 2010 sixth-rounder. Carolina used its ’09 pick on CB Captain Munnerlyn, then took DE Greg Hardy with that extra selection the following year. Handicapping the Rookie of the Year races: Who could take the NFL by storm? Vilma’s six-year Saints career is sort of split in half down the middle—three seasons as a tackling machine up the middle of New Orleans’ defense, and three overshadowed by injury and the "Bountygate" scandal. Before the 2011 downturn, though, Vilma turned in three consecutive 100-tackle seasons for the Saints. He also brought home a Super Bowl ring at the end of the ’09 season. A fellow starter on the title-winning defense was linebacker Scott Shanle, whom the Saints acquired by trading a seventh-round pick to Dallas in 2007. That trade certainly has a claim to the Saints’ draft throne, as well. Shanle, a seventh-round pick back in 2003, started 94 games for the Saints from ’06–12. A lot of choices in recent years for the Bucs, counting a trio of moves via the 2015 draft that landed them OL Ali Marpet (picks No. 65 and No. 109 for No. 61 and No. 128), LB Kwon Alexander (pick No. 102 for Nos. 124, 161 and 242) and G Logan Mankins (Tim Wright and pick No. 101). They also traded up five spots during the 2012 draft, from No. 36 to No. 31, to select RB Doug Martin—his current status is in limbo, but he also has two 1,400-yard rushing seasons. That same 2012 draft is when Tampa Bay pounced on David, who had slipped deep into the second round. David has started all but two games for the Buccaneers since hearing his name called, and he has both a Pro Bowl (2015) and All-Pro (’13) honor to his credit. A bevy of recognizable names came off the board between David’s spot at No. 58 and the Texans’ selection of WR Devier Posey at No. 68, including Kelechi Osemele, Casey Heyward, Reuben Randle, Dwayne Allen and Ronnie Hillman. The Bengals’ top draft trade from 2007–16 came when they dealt Palmer to Oakland. For the Cardinals, it was in taking Palmer off the Raiders’ hands a season and a half later. Palmer could surpass 15,000 yards and 100 touchdowns as a Cardinal as early as Week 1 of this season. Who knows what might have been for Arizona in 2014 had Palmer not torn his ACL—Bruce Arians’s club started the season 9-1 (6-0 with Palmer in the lineup), only to bow out in an ugly playoff loss. That year also marked the rookie campaigns of LB Deone Bucannon and WR John Brown, selected at picks 27 and 91, respectively, during the ’14 draft. Arizona inherited those draft slots via a trade down from No. 20—the Saints moved up for WR Brandin Cooks. Selected: CB Janoris Jenkins, OT Greg Robinson; trade pick No. 6 to Dallas for picks 14 (DT Michael Brockers) and 45; traded No. 45 in a trade with Chicago for picks Nos. 50 (RB Isaiah Pead) and 150 (OT Rokevious Watkins); traded the ’13 first (No. 22) to Atlanta for picks Nos. 30 (LB Alec Ogletree), 92 (WR Stedman Bailey) and 198; traded pick No. 198 to Houston for pick No. 160 (RB Zac Stacy). Whew. Got all of that? In total, eight players made their way to the Rams (then in St. Louis) to put the finishing touches on Washington’s trade up for Robert Griffin III. Brockers remains a starter up front for them on defense, and ditto for Robinson on offense, although he’s been disappointing on the whole—the Rams declined his fifth-year contract option, adding some drama to his 2017 season. And Ogletree has started 52 games as a Ram, a number that should grow. So, that’s pretty good return. It would be even better had Jenkins found his footing before leaving town—he was a Pro Bowler for the Giants last year. The celebratory draft-trade moments are rather lacking otherwise. A slight jump up the board in 2014 for CB Lamarcus Joyner arguably is the top option, outside of the RGIII bonanza. There, the Rams sent picks No. 44 and No. 153 to Buffalo for pick No. 41. His presence in the headlines has been borderline Trumpian by NFL measures, so perhaps it’s worth pointing out that the 49ers probably would go through with their Colin Kaepernick trade again, if offered a redo. In 2011, San Francisco traded pick Nos. 45, 108 and 141 to Denver for spot 36, which is used on Kaepernick. Obviously, it all fell apart in time but Kaepernick helped the 49ers to the Super Bowl in 2012 and AFC title game in 2013. Two other key figures of those teams acquired via draft trade: Mike Iupati (picks No. 43 and No. 111 for a ’10 first, used on the All-Pro guard) and LB NaVorro Bowman (pick No. 79 for No. 91 and a ’11 fourth). However, the sheer longevity of Staley’s tenure in San Francisco pushes that trade to the top. He is locked in as the starting left tackle again for 2017, which will make his 11th season on the first-team offense. Staley has 143 starts and five Pro Bowls to his credit as a 49er. He’s probably an extreme long shot for the Hall of Fame, but he’s already claimed a spot in the mythical Hall of Very Good. The ’08 first-rounder San Francisco traded away landed at No. 7 overall, so it was a costly move for Staley. But it’s still a reasonable price to lock down the LT spot for a decade. From just 2009–12, using a variety of draft picks, the Seahawks acquired Thomas, WR Golden Tate, S Kam Chancellor, CB Richard Sherman, RB Marshawn Lynch and LB Bobby Wagner. The stories of Chancellor and Sherman were credits to scouting and good fortunes, as those players were uncovered at picks No. 133 and No. 154, respectively. The Lynch trade (No. 122 in 2011 and a conditional ’12 selection) still should haunt Buffalo. In Thomas, though, the Seahawks selected a player who has become the signature example at his position. He was a Pro Bowler from 2011-15 and a first-team All-Pro from 2012–14—he might have earned both honors again last season, were it not for a December leg injury. The Broncos’ 2010 first-rounder landed at No. 14, or 23 spots below the point to which they traded up in ’09. The player they so badly wanted: CB Alphonso Smith, who was on their roster for a year before they traded him to Detroit for TE Dan Gronkowski. The lesser-known Gronk wrapped his NFL career in 2011 with nine receptions. The Bills have orchestrated two massive top-10 trades over the past decade: Their aggressive 2014 leap to No. 4 for WR Sammy Watkins, and their move down from No. 8 to No. 16 a year prior—the Rams took Tavon Austin, the Bills nabbed EJ Manuel and later Kiko Alonso, among others. Neither deal has paid off the way Buffalo had planned. The team is still holding out hope that both Watkins and 2016 draft pick Reggie Ragland (picks No. 49 and No. 117 for No. 41) return obvious value on investment. Until then, the Wood trade takes top honors. In a one-for-one comparison, it’s not really a win—Peters has been a seven-time Pro Bowler and two-time All-Pro for the Eagles, maintaining his status for many years as one of the league’s top left tackles; Wood has just one Pro Bowl berth spread over his eight seasons and 104 starts. But Peters and the Bills were headed toward an ugly split, with Peters having held out in 2008 and likely to do so again in ’09. So, Buffalo did the best it could, and wound up with a quality starting center. Bonus points for creativity. The Dolphins and Eagles completed this deal several weeks before the draft, as Philadelphia set its sights on a top-two pick and QB Carson Wentz. The entire gambit was a leap of faith by Miami that Alonso and Maxwell could revitalize their careers on a new team. Each played a key role in the Dolphins’ playoff push a year ago, and GM Chris Grier in turn handed Alonso a contract extension in March. Better yet, Tunsil—in a draft night bong photo-induced twist—fell into the Dolphins’ lap at No. 13. Miami has had a few other moments of draft-trade success in recent memory, too. Their surprise dumping of Mike Wallace in 2015 eventually netted them now-starting RB Jay Ajayi (pick No. 232 and Wallace for pick No. 149). And they traded up for both RB Lamar Miller in 2012 (picks No. 103, No. 196 and a ’13 sixth for pick No. 97) and underrated safety Reshad Jones in ’10 (picks No. 174 and No. 219 for No. 163). The Patriots saddled the Raiders with a killer "what if" here, moving up a measly two spots and landing Gronkowski, who since has established himself as an all-time great tight end. The Raiders took DE Lamarr Houston and LB Travis Goethel with the picks New England sent back. True to Bill Belichick’s mad scientist reputation, though, acquiring Gronk for pennies on the dollar is not a runaway "best trade" winner. When talking about the NFC West above we touch on the success Seattle had found through draft trades and ... long story short, it’s not a mistake that some teams maintain success over several years. In 2013, the Patriots traded down from pick No. 29 and subsequently walked away with Jamie Collins, Logan Ryan and LeGarratte Blount. In 2012, they traded up in Round 1 for both Chandler Jones and Dont’a Hightower. And 2007 brought a flurry of moves: a second- and seventh-rounder to Miami for Wes Welker; a fourth-rounder to Oakland for Randy Moss; Deion Branch to Seattle for a first-round pick. The Patriots’ recent draft-trade history includes a remarkable list of star power. By 2008, Revis was a Pro Bowler. By 2009, he was an All-Pro and the Jets were en route to the first of back-to-back AFC championship appearances behind the NFL’s top defense. The Panthers flipped Nos. ​25 and ​59 into LB Jon Beason and C Ryan Kalil, respectively, so this is about as close to a win-win trade as it gets. For the Jets, though, it was a game-changer. Even more so when they were able to parlay pick No. 191, along with Nos. 63 and 89, to go get Harris. The other Jets’ blockbuster of the last decade under consideration also involved Revis—only this time, he exited the New York scene when in 2013 the Jets shipped him to Tampa Bay for pick No. 13 and a ’14 fourth-rounder. They used that No. 13 overall pick on DE/OLB Sheldon Richardson. There is an argument to be made here for the Ravens’ 2008 trade up from No. 26 to No. 18 to draft Joe Flacco. Say what you will about Flacco and his ever-discussed "elite" qualities, but he has been the starting QB in Baltimore for nine years and owns a Super Bowl MVP trophy. The Ravens handed Houston pick Nos. 26, 89 and 173 to go get him. The Flacco acquisition (the Flacquistion?) still pales in comparison to the value Baltimore found in Yanda. That No. 86 pick with which the Ravens selected Yanda fell midway through Round 3. It cost them just a fourth-, late fifth- and late sixth-round pick to make it happen. Yanda has since started 133 games—with six Pro Bowls and two All-Pro bids—and could have a Hall of Fame case when he’s done. This deal actually occurred midway through the 2011 season, after Palmer—unseated by a rookie Andy Dalton—threatened retirement unless the Bengals traded him. An injury to Oakland QB Jason Campbell provided the opportunity, and Cincinnati managed to bring back two high draft picks in return. Kirkpatrick recently signed a lucrative, long-term contract extension, while Bernard has accumulated more than 4,100 yards from scrimmage as part of the Bengals’ backfield. Historically, the Bengals have been one of the NFL’s quieter teams when it comes to draft trades. Since their disastrous 1995 jump to No. 1 overall for RB Ki-Jana Carter, the Bengals have not traded up in the first round. They did, however, move up in Round 4 during the 2014 draft to nab center Russell Bodine (picks 123 and 199 for 111). He has been a starter, albeit an oft-criticized one, for three seasons now. Which 2016 trade down do you prefer? The one in which Cleveland dealt Nos. 2 and 139 to Philadelphia for Nos. 8, 77, 100, a 2017 first- and 2018 second-rounder? Or this one, which netted the Browns a starting wide receiver and their potential QB of the future? Both came with the same design: to help stockpile a depleted roster with young talent. Keeping track of how it all played out is enough to give one a headache. The trade down from No. 2 led to this trade down from No. 8. The Browns then also traded out of spots 77 (acquiring picks 93, 129 and 168) and 100 (acquiring picks 114 and 154). They walked away from all those moves with Coleman, Coleman, Kizer, Cody Kessler, Derrick Kindred, Spencer Drango, Ricardo Louis and Jordan Payton. Whew. Another team that just does not unload its draft picks often. From 2007–11, the Steelers’ lone trade up was a ’07 fourth-round move for punter Daniel Sepulveda (pick No. 119 and No. 192 for No. 112). They have swapped picks for players, on occasion, as was the case when Pittsburgh spent 2016 picks to acquire CB Brandon Boykin and K Josh Scobee (Nos. 164 and 201, respectively). But for the most part, this is a stick-and-pick organization. Fortunately for the Steelers, they were willing to talk trade when the Cardinals climbed 40 spots to select QB John Skelton. At the time, the key name in that deal looked to be McFadden, who started 16 games for Pittsburgh in 2011. It goes without saying that Brown’s ascension changed the narrative. This is the only trade in our AFC retrospective that doesn’t involve the team making an actual pick. The Texans, though, have yet to match the sign-and-trade they pulled off with the Broncos ahead of the 2008 draft. From the time he moved to Houston through the end of his career after the 2014 season, Myers did not miss a single game—a total of 112 straight starts at center, with two Pro Bowl bids to boot. OT Duane Brown’s streak did not reach Myers’s level, but he’s still locked in on the left side of Houston’s line—the Texans acquired him via that Flacco trade, sliding back eight spots. Between Brown and Myers, the Texans secured 40% of their offensive line via the 2008 draft. They’ve had other minor victories, like trading QB Matt Schaub away for pick No. 181 of the 2014 draft, then using that pick on RB Alfred Blue. But the Myers move was a signature moment. Close call for the Colts between this slight move up—from the top of Round 4 to the bottom of Round 3—and the 2012 trade with Miami that brought CB Vontae Davis to Indianapolis. The latter deal cost the Colts just a second-round pick in 2013 (No. 54), because Davis did not play enough snaps during the ’12 season to tack on a conditional sixth-rounder. Davis has missed just three games the past four years, and he’s now a two-time Pro Bowler. Still, hard to quibble with the price tag on Hilton. For the low cost of a 2013 fifth-rounder (which San Francisco used on DL Quinton Dial), the Colts jumped five spots and drafted a player who led the league in receiving yards last season. Double whammy in 2012 for the 49ers, too: They moved pick No. 92 to the Colts, who took Hilton, and then traded pick No. 97 to Miami. The selection at that spot? RB Lamar Miller. The Jaguars have little recent history of trading down early in drafts, and they have not been all that fortunate when trading up—four picks for DE Derrick Harvey in ’08, a first and a second for QB Blaine Gabbert in ’11, a first and a fourth for WR Justin Blackmon in ’12. The tide appears to have changed in their favor recently, however, and the Robinson pick stands as evidence. The Penn State product was not as productive last season as he was in 2015, but he’s still chalked up nearly 3,000 yards receiving as a Jaguar. There might be a decent-sized payout on a small wager from 2016, as well. 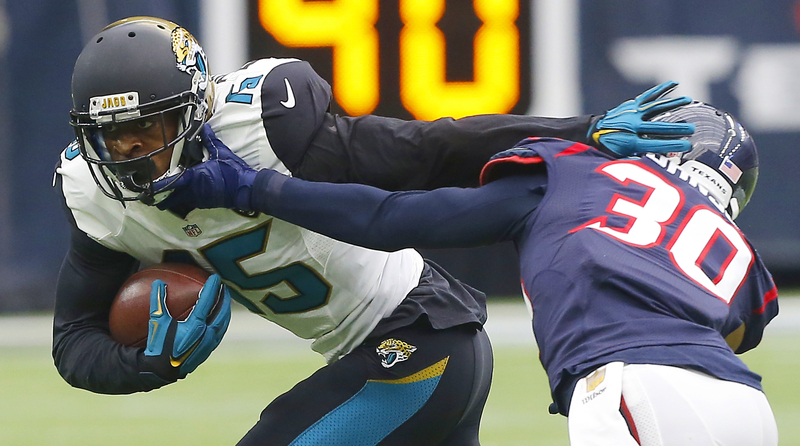 Early in Round 2 last year, the Jaguars flipped picks 38 and 146 to Baltimore so they could draft LB Myles Jack, who slipped due to injury. He’s expected to be a cog on defense this season. There certainly is a little luck involved in all of this. The Titans just so happened to fall into the No. 1 overall pick the year after selecting franchise QB Marcus Mariota, which meant they were able to dangle that draft slot in front of the Rams. Look at the haul that came out of it. Conklin, Henry and Davis could form the backbone of the offense around Mariota for years to come, and Smith will learn from Delanie Walker. If the Titans had any complaint out of this, it’s that they did not pick in Round 2 this year—they moved it as part of the Conklin package. The Titans also pounced last year on DeMarco Murray falling out of favor in Philadelphia. The cost to acquire him: pick No. 100, and the Eagles sent No. 113 back (one of the picks the Rams later added). Murray rushed for almost 1,300 yards last season. Connecting the dots through the entirety of this move is fascinating. The Broncos traded up from 84 to 64 in ’09 for Quinn, who caught one pass in two seasons. The Steelers then drafted WR Mike Wallace with that 84th pick. Then, holding the Bears’ first-rounder in 2010, the Broncos traded down from 11 to 13 to 24 and then back up to 22 for Thomas. Along the way, they picked up pick No. 87, which they used on WR Eric Decker, and pick No. 70, which they flipped as part of a package for Tim Tebow at No. 25. Among the players taken with picks traded away by Denver: Dez Bryant (No. 24), Brandon Graham (No. 13), Aaron Hernandez (No. 113), Anthony Davis (No. 11). One trade to keep tabs on moving forward: Denver’s 2015 deal for Shane Ray. The Broncos traded three picks (Nos. 28, 143 and a 2016 fifth) plus OL Manny Ramirez to Detroit, then took Ray at No. 23 overall. OK, so forget about that Jon Baldwin part—he caught 41 passes for 579 yards as one of the Chiefs’ all-time draft busts. The Browns traded up to 21 for DT Phil Taylor, which is only marginally better. The real focus is on that selection of Houston. 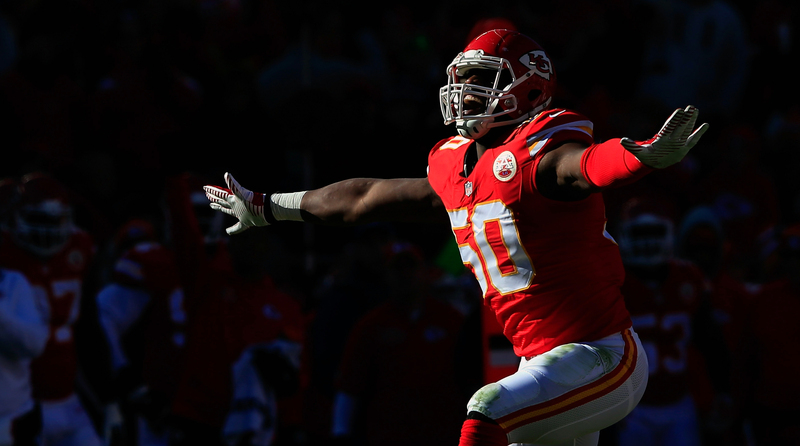 Without the extra third-rounder handed them by Cleveland, the Chiefs may not have acquired the dynamic defender, who currently sits fourth on the franchise’s all-time sacks list. The Chargers’ top trade may have been the easiest call of any AFC franchise. In hindsight, a second, two thirds and a fifth amounted to highway robbery for Weddle, a four-time Pro Bowler (three with the Chargers), two-time All-Pro and the face of San Diego’s defense for years. The Bears didn’t do much with the capital floated their way, either—none of the picks they made played more than four seasons in the league. The only other Chargers trade of the last decade with hope of approaching Weddle’s impact is the one they pulled for Melvin Gordon in 2015 (picks No. 17 and No. 117 and a 2016 fifth-rounder for No. 15). Gordon was a Pro Bowler last season after a miserable rookie year. He needs to rush for 2,623 more yards to match the Chargers output of RB Ryan Mathews, who landed with the organization following a big Round 1 trade (Nos. 28, 40, 126 and LB Tim Dobbins to Miami for Nos. 12, 110 and 173). Maybe the trade-down success stories do not deserve as much credit as the trade ups, because teams were not actively hunting specific players. That said, results are results. And here, the Raiders dropped 14 spots and still found a linchpin for their offensive line—Jackson is on the verge of a hefty contract extension. McGill has yet to find any notable success, but he’ll have a chance in camp this year to win playing time at safety. The lingering question: Does Jackson’s early success propel this trade ahead of Oakland’s stunning 2011 trade for Richard Seymour? The Raiders gave New England pick No. 17 overall for the three-time champ, in the hope that Seymour could help propel them over the top. The veteran defensive lineman did notch a pair of Pro Bowl bids as a Raider, but his Oakland teams never made it above the .500 mark. The Patriots used that 17th pick on OT Nate Solder.